Chicken Mushroom and Potato Casserole - Let the Baking Begin! This Chicken Mushroom and Potato Casserole recipe is loved by my whole family. A chicken casserole with potatoes, bacon, and mushrooms. One of the best Casserole recipes! Growing up, my mom made a similar casserole recipe. She made one just like this one but she called it French Style Potatoes. The only difference from the recipe below is that she smothered each layer of the casserole with mayo, which I am not a fan of. 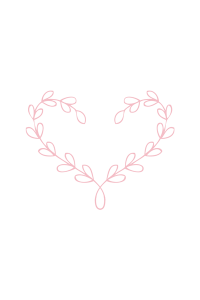 So I made some additions/substitutions that you might like! I added some crisped up smoked bacon that added an amazing aroma as well as flavor to the dish, and all that rendered fat was then used to brown the mushrooms. Yuummm! If you’re looking for a spin on the traditional meat and potatoes dinner, I think you’ll love this one! Having the potatoes roast in the juices of the chicken, mushrooms, and bacon makes the potatoes so tender and absolutely amazing! This potato casserole is not the same without the meat and mushrooms! Make it once and this casserole will be your new family favorite comfort food! Can I omit mushrooms in this chicken casserole? Of course, you can! Only you know what your family loves best and omitting the mushrooms from this recipe is totally ok. If you want to really up the recipe, you can add more cheese to the top of the potatoes and make it really ooey and gooey. 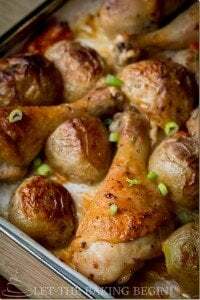 This is a foolproof recipe that is guaranteed to make your dinner table go silent as everybody will be too eager to stuff their faces with this mouthwatering Chicken Mushroom and Potato Casserole! Cook the bacon until crispy. Add onions, cook until golden. Remove onions and bacon leaving the grease. Heat the leftover bacon grease, saute mushrooms until brown. Peel and slice potatoes into ⅛ inch slices. Add salt, pepper, and garlic powder and toss to coat. Cut the chicken into 1-inch pieces and season. In a casserole dish add a layer of chicken. Then half the bacon and onions, and a little bit of cheese. Next add mushrooms, the rest of the bacon and onions, cheese, and salt and pepper to taste. Lastly, place the potatoes on top. Mix and pour the chicken stock and cream on top. Cover dish with foil. Bake for 15 minutes at 450 F, then reduce to 350F and bake for another 40 minutes. Remove the foil and bake for an additional 20 minutes. Once done, sprinkle some cheese, fresh greens, and serve immediately. Note: this chicken mushroom casserole can be prepped ahead of time by preparing and layering everything but the potatoes. When you’re ready to cook the dish, just peel, slice, layer the potatoes and put it in the oven and follow with the rest of the instructions. There are many ways you can prepare meals with meat and potatoes. I especially love preparing casseroles. They are easy and so yummy. 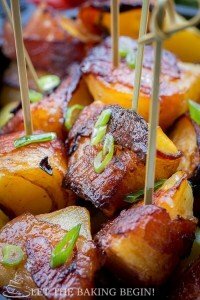 What is your favorite Meat and Potatoes dinner recipe? Share in the comments below, I would love to hear about your favorites! Other easy dinners you will enjoy! Cheesy Parmesan Crusted Salmon Bake – Salmon smothered in cheese! Yum. Beef with Caramelized Onions and Mushrooms – A great roast beef dish! 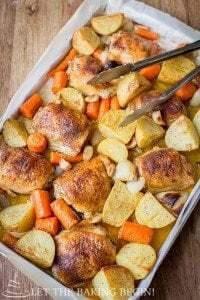 One Pan Chicken and Potatoes – Simple one pan dinner recipe! Potato casserole with chicken, mushrooms, bacon, and cheese. The casserole is layered and baked in the juices of the meats making a delicious casserole dish. Heat a skillet over medium heat, add the chopped bacon and render the bacon until it crisps up. Add chopped onions to the bacon and continue cooking until the onion is golden in color. Tilt the skillet to the side allow the fat to drip to the bottom and remove the onion and bacon in a separate bowl. Heat the skillet on high with the bacon fat in it, add quartered mushrooms and brown them over high heat, stirring frequently. Remove from heat. Peel potatoes and slice them into ⅛ inch slices using a mandolin slicer or a knife. Add salt, freshly ground pepper and garlic powder or ranch seasoning and toss to coat, separating the slices to season evenly. Cut the chicken breast into 1-inch pieces. Add seasoning (salt, black pepper, garlic powder or ranch powder) and toss to coat. Layer the ingredients in the following order: chicken, half of bacon and onion mixture, light sprinkling of cheese, mushrooms, bacon & onion mixture, a little bit of salt & pepper to season the mushrooms, light sprinkling of cheese and lastly toss most of the potatoes on top, leaving about ⅓ of them to arrange nicely on top of everything else. Now mix the chicken stock & cream (or replace the cream with stock if you want to save on calories) and pour on top. Cover the baking dish with foil or lid. Place into preheated to 450F oven and bake for 15 minutes, then reduce heat to 350 and bake for another 40 minutes. Remove the foil or the lid and cook for additional 20-30 minutes or until the top is golden brown. Once out of the oven sprinkle with some cheese (it will melt from the potatoes being hot), chopped chives/green onion & parsley. Serve immediately. Notes: this casserole can be prepped ahead of time by prepping and layering everything but the potatoes. When you’re ready to cook the dish, just peel, slice, layer the potatoes and put it in the oven and follow with the rest of the instructions. I understand that nutritional values are not exact And depend on the maker for the most part. But when I look at yours, on this recipe it doesn’t tell me how many servings this particular recipe yields. it doesn’t tell me what a serving actually is, as far as size. I’m sure I can research and figure it out for myself, but it would be nice to be able to use the information that you’ve listed. It looks delicious and I’m going to make it this afternoon. On the recipe card, right above the ingredients you will find that this recipe is for up to 6 people. These are modest portions, so if you’re feeding men or want leftovers, you can increase the recipe. Hello! Thank you for the recipe. I just took it over to my neighbor’s home. I only tasted the sauce and it was amazing. Also, I used beef stock and that is tasty. In this week I want to cook it again for my family. Does the liquid need to cover all of the potatoes or just go underneath to the lower layers? Just underneath the lower levels. It doesn’t have to cover anything, because the ingredients are baked even if there was no liquid at all. Thank you! It was delicious!!! The family loved it also ! That’s great! Thanks for getting back! This was good. I made a few changes the second time I made it: I added 2 tsp fresh thyme leaves to the chicken, seasoned the mushrooms while sautéing, browned the chicken for two minutes, and made a roux with 2 Tbsp each of flour and butter. After browning the roux for a minute or so, I whisked in the chicken stock, the half and half (1 cup of each), and added in a quarter cup of gouda. I seasoned the sauce with salt, pepper, and two minced garlic cloves. Wow, I like your changes! Looks like you know your way around the kitchen pretty well! Thanks for sharing! Thank you for your great review Tanya, really appreciate you taking the time! Looks scrumptious!! I’m going to try and double this to bring to work for my co-workers. I think they’ll love it. It just looks so comforting. I like the suggestion of carrots that another poster had, and the use of half-n-half to cut calories. Thanks for a wonderful recipe!! Thanks Judy! You can never go wrong with meat and potatoes, right? Made this casserole last night and it was so mouth watering good. It reminded me somewhat of Chicken Pot Pie without the pastry crust. I used salt pork cut up very small instead of bacon … also used real garlic (2 cloves minced) instead of garlic powder. I only had half the amount of mushroom but I had a head of broccoli in the fridge so I fried it up only a couple of minutes to sweat it and added it to the mushroom mixture. To the chicken I added salt, pepper, thyme and a little smoked paprika. I baked it exactly as directed and OMGoodness it turned out so good that this will be a keeper in our house. It’s the type of recipe that you could easily double when the kids are visiting with the grandkids. What a great review, thanks Summer for your feedback! 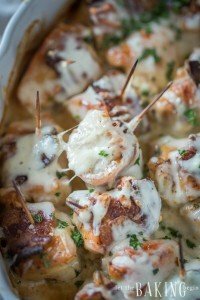 Hope you find more great recipes that your family will enjoy on this blog! Haha Kristen, that might be it! 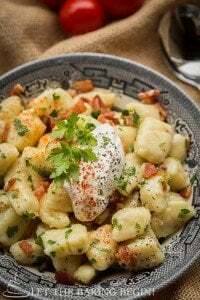 In Ukraine, they didn’t really sell the pre-packaged heavy cream, which is used in tartiflette, so mayo might’ve been what they used to substitute it with. I know, not ideal, but I guess when you have to make do with what you got, this works? Hi. Can I prepare this a day ahead and refrigerate, and cook it the next day? you can probably prepare everything but the potatoes. I would think that the potatoes would turn brown if not cooked right away. Delicious. Huge hit with everyone. I even put in some cut up carrots, only because I had them. Wanted it to be a one pot meal. Too lazy to make a salad. I made gravy on the side but didn’t need it. Will definitely make this again. Can’t wait to eat it for left over. Thanks for the recipe. Thanks Nancy for your wonderful review! My girlfriend and I have made this several times and never the same way. Mix chicken and potatoes , sometimes adding broccoli florets and or cauliflower, cream soups in place of heavy cream. Every time it is WONDERFUL!!!! How much salt/pepper and garlic powder please? quantities of spices for both the potatoes and chicken portion please? thanks look amazing! The fact that my boyfriend doesn’t like mushrooms just kills me, because I love them!!! I’ll have to make this but I think i’m going to have to skip the mushrooms :(. Or just make a smaller portion just for myself with a ton of mushrooms ;). My hubby does not like mushrooms. I always substitute carrots or peas. Does the chicken cook through? I almost want to brown it before I put the chicken in the bottom. Oh yes! It cooks though and becomes very soft and tender. But you can definitely brown it before adding it. It will be good either way. I did make your recipe last night and it was delicious. However, I had a lot of extra liquid and needed a slotted spoon to serve. Any tips? It also took quite a bit of time to put it all together for a Monday night! Have you ever made two batches of the base and freeze one? I know that you mentioned preparing everything early and then adding the potatoes before baking. I wasn’t sure if you have tried freezing it. Not sure how the mushrooms would hold up? Hi! Man, this looks sooo good!! My mouth is watering 🙂 Im planning to make it this week, but I have a question: the recipe asks for cream. Do you mean heavy whipping cream/half&half? Hi Eve, I use heavy whipping cream but if you want to go lighter on calories you can use half & half. It was simply delicious! I had to halve most ingredients as my casserole dish is tiny. Thank you! Making this dish for Super Bowl . This casserole is the epitome of comfort food! It looks plain glorious! yes it is, thank you Julia! Marina what is the size of your casserole dish?